Felids are divided into two main groups. The purring cats are genus Felis and the roaring cats are genus Panthera. Felis is Latin for “cat” and panthera is Greek for “cat.” All tigers are subspecies of Panthera tigris. Of the now nine subspecies, the Balinese, Javan and Caspian are extinct. Only 200 Siberians were known in the wild before the fall of the Russian Government and only 200-300 Sumatrans are known. 2000-3000 Indian (Bengal) Tigers are known in the wild. The Siberian Tiger is the largest of all extant cats. The Sumatran is the smallest extant tiger. Malayan and Indo-Chinese are intermediate between these and the Bengal. The Indo-Chinese Tiger is in Thailand and its neighbors. The Malayan is found in two small regions of Malaysia. The Sumatran is on that Indonesian island. The Bengal uses scrub forests, especially “elephant grass” habitats in India. The Amur is currently only found in the Amur-Ussuri region of far-eastern Siberia. Wild – Deer, peafowl, wild pig or whatever it can catch. 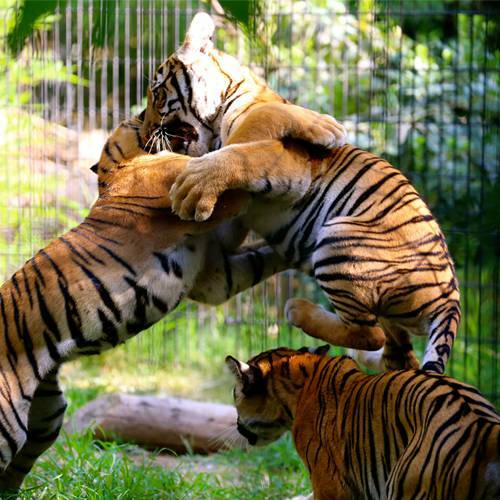 Zoo – Spectrum Feline Diet (5 days), one day fasting, one day muscle meat and bone. The underside of all tigers is whitish, but the background color varies from light reddish-yellow to rust brown. The stripes are black, or a very dark brown and are wider in some subspecies than in others. The ears are black with white spots on the back. The cheek-hair of some subspecies is long and white, but, in other subspecies, it is no longer than the body hair and orange. The relatively short neck-mane is shortest in the Malayan and Indo-Chinese. Siberians are the lightest, being pale yellow in winter and light orange in summer. Melanistic black forms are known, but not nearly as common as the recessive white (non-albino) form, specially-bred in captivity. White Tiger survivability in the wild is very low as they are too visible when they hunt. Tigers usually attack prey from ambush and from the side or rear. After a kill, a tiger will drag prey into dense cover where it will continue to feed at its leisure. Tigers drink frequently during a meal, so the prey is often hidden near water. All Tigers readily enter water and, during the hot dry-season, Tigers spend much of the day resting near streams, often lying or standing in quiet water to keep cool. Fresno Chaffee Zoo’s Tigers do the same thing. Tigers are powerful hunters with forearms as big as a man’s thigh. With a typical cat build, the hind legs are slightly longer than the front, providing jump-power. The impact of a tiger’s charge is tremendous. Tiger stripes blend into the vertical shadows of their habitat’s moderately dense cover, often tall grasses. The white under-tail and ear spots are often called “follow-me spots” because they are the only things really visible to the cubs as they follow their mother. Tigers are solitary, except for mating season. Females will only be with offspring. Loose female territorial boundaries blur. Male Tigers have large, defended territories that over-lap several female territories. Gestation is about 3 ½ months and 3 or 4 altricial cubs are born, each weighing about 2 pounds. They are totally dependent on the mother for 18 months, usually staying in her range for 2 ½ years. They reach sexual maturity by 3 – 4 years of age. Longevity in the wild is to 15 years, with captive animals living to 20 years. Lifespan Longevity in the wild is to 15 years, with captive animals living to 20 years. Length 4-5 feet with 3-4 foot tail. Height 2.5-3 feet at shoulder. Diet Deer, peafowl, wild pig or whatever it can catch. Habitat Forest Habitat, Grasslands, Wetlands. All surviving subspecies are Endangered or Critically Endangered. The total global Tiger population is estimated to be less than 5,000 animals, with the total effective population (breeding adults) at about 2,000. Tigers can easily jump over 15 feet in length.